That’s really a song. I promise. George Straight sings it and once back in my LimeWire days, I got the nastiest computer virus trying to illegally download it …What an expensive song that turned out to be! Anyway, I often wonder if anyone besides Texans have ever heard it. I keep thinking of my brother off in snowy cold Utah, and I wanted it to be a Texas Christmas for him, so I made him these. I cannot decide if my favorite is the rope snowflake, or the sand globe. A snow globe doesn’t really make sense here…come to think of it neither do snowmen! 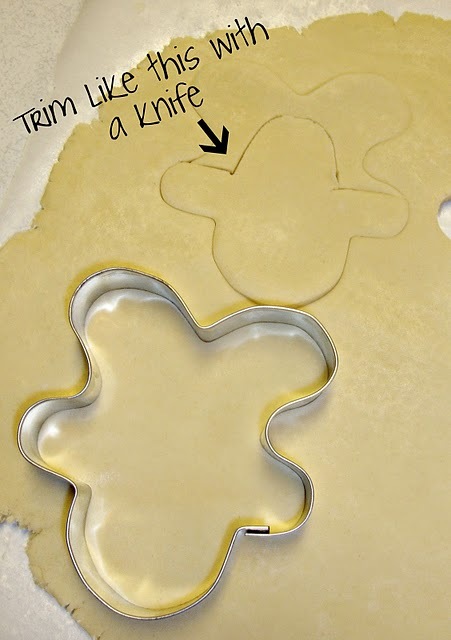 If you like Cowboy Frosty, he’s pretty easy to make! I came up with two ways of course, the hard way, and the easy way. 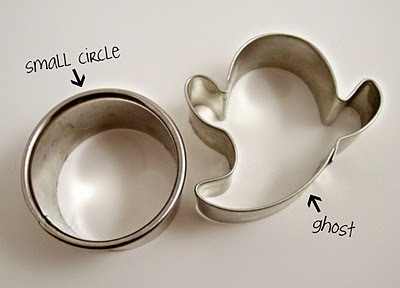 For the hard way, you will need your ghost cutter (it doesn’t have to be this one, as long as it’s the same general idea) and a round cutter that looks proportionate to the hat. Don’t make it harder than it has to be. You’re not after perfection. The details can be worked out later with icing. 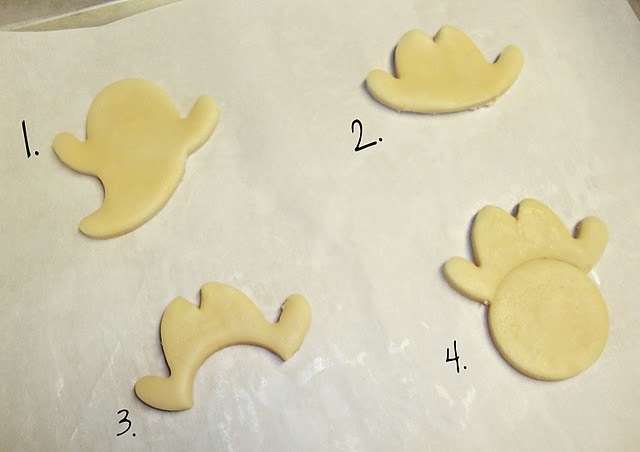 Follow steps 1-4, and you will have a cowboy snowman in no time flat! I mangled one of my many gingerbread men to make a rounder snowman face…then I cut him out and used a knife to finish out the details. It might look a little complicated, but it’s a heck of a lot easier than that apple pie I mentioned earlier! After I made these, I got a wonderful surprise in the mail! 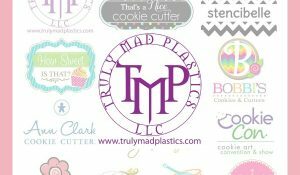 I recently won TWO awesome Ecrandal cutters in giveaway on Glorious Treats. At first I was more excited about the snow hat, but when I received them, I fell in love with my waving gingerbread man. I had to try him IMMEDIATELY!!! I altered him a little to match the rest of my theme. Isn’t he cute? You astound me with your talent.. Kinda makes me sorry Christmas cooking is over here at this house (THANK GOD)…. 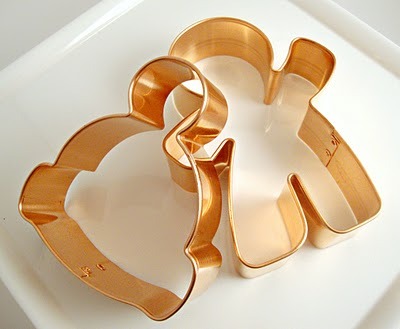 Come up with some creative ideas for valentines but do it a few weeks early… Not asking much here in Dothan, AL are we!! Merry Christmas! Love these to pieces!!!! Have a merry Christmas and Happy New Year, Callye! I just LOVE that every time I visit, you have outdone yourself! I love them all especially the rope snowflakes, they are WONDERFUL!!! How the heck did you figure that one out??? You must dream cookie cutters!!! I don't think I would ever look at the ghost and say……"you could be a western snowman". Thanks so much, Diane, Cookie, Brooke and Lis…Landa, I lobe u! 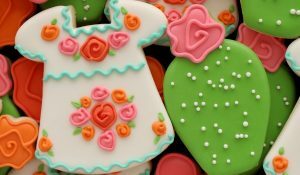 These cookies are really extraordinary! The design and engineering are so cool. These are really cool – I like the rope snowflake the best. Awesome awesome awesome!! Many thanks. I am so excited. I will talk to you soon. Have a blessed Christmas. The sand globe is my favorite – but the lasso-ing (is lasso-ing a word?) gingerbread man is a close second! So cool, I love them all!! I used to be AMAZED…not anymore! 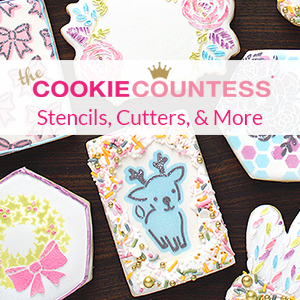 You are so talented I just look at your cookies in awe now and expect greatness everytime…you never disappoint! 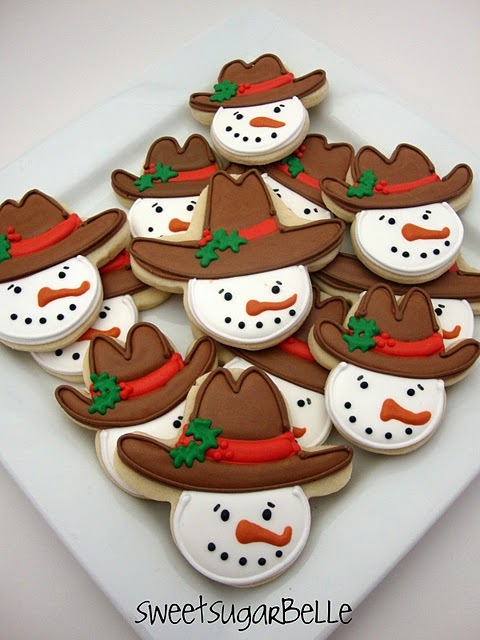 LOVE the cowboy snowman idea, I might give it a try if Christmas wasn't tomorrow…maybe next year! Thanks again for the inspiration…hopeyou and your family have a wonderful Christmas and a happy New Year! Those. Are. Awesome. 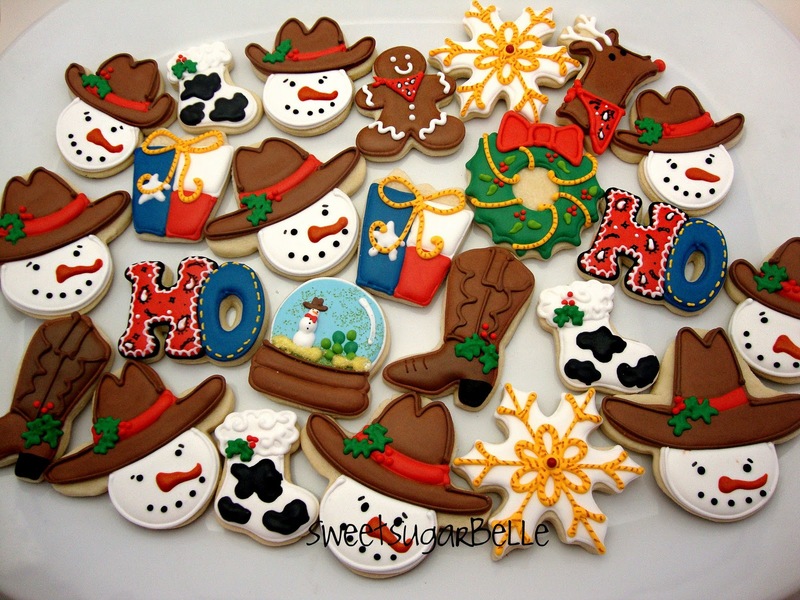 Love love love the rope snowflake, the sandglobe, the snowman/cowboy, the gingerbread man and deer with the bandanna, the stockings, everything is just amazing and so so so clever and creative. I so wish I had more time to create more fun stuff…. 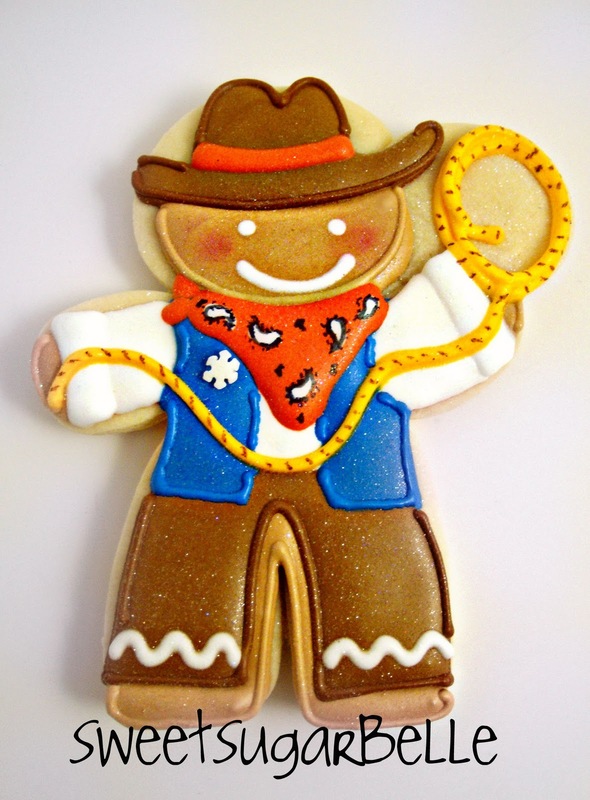 I'm catching up on all of you blog posts and I must say that the gingerbread cowboy is too freaking cute to stand. The little touch with the snowflake sprinkle badge is perfecto! I love these cookies! I currently live in New Mexico, but grew up in Texas and will be going “home” this Christmas to see family and will be bringing these with me! Thanks for sharing your creativity! Also, I know exactly which song you’re talking about! I love it! Also, have you heard the George Strait Christmas cookie song? It’s one of my favorites too! Well hello neighbor! Where are you from? I’m *almost* a New Mexican. I am 30 miles from Hobbs and Dad and Mom grew up there, AND both graduated from ENMU! I’m in Las Cruces. We are pretty close! I remember you mentioning something in your blog about being in Crane, TX for a holiday too. I lived in Odessa for a year after I got married and have an aunt who lives in Crane! What a small world. 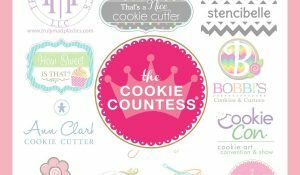 Another funny coencidence, a girl I went to high school with designed your blog! Erin? We had classes together. Nice lady. The way things are going, we may bump into each other one day! Well, ya’ll outdid yourself! This cowboy critter and various Western accessories roped me in and lassoed my heart. Oh my god!! They’re absolutly incredibles!! Congratulations!! Thank you for sharing your knowledge about this. 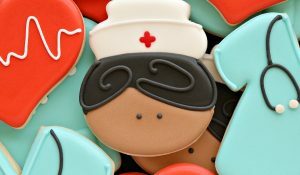 Your cookies are the cutest I’ve ever seen! I can’t begin to imagine the time that goes into creating each one. I admire your talent! You are an inspiration. I just might need to start baking cookies again. I’ve been trying to get in touch about linking to this post on my upcoming blog post about Christmas in Texas. Not sure if you got my previous email or saw my comment on Facebook. Please respond with a yes or no. Thanks for the consideration. I totally missed it…my last baby has been eating my lunch, for two years now. But definitely YES! And thank you for being kind enough to ask! Thank you very much. I’ll stop by and leave the link to the post once I’ve published it next Monday. Hope you enjoy some beautiful holidays. Thanks again for permission to link.